Scottish Rugby chief executive Mark Dodson has shot down heavy criticism from one of Europe's leading sports management consultants. Alistair Gray, founder of the Renaissance Group, said the governing body had delivered an "embarrassing" corporate performance. "If I was upset by one person's opinion I wouldn't come to work in the morning," Dodson told BBC Scotland. "There's five million people in this country and they will judge what I do." Gray is a former client of Scottish Rugby, the Scottish Football Association, Lawn Tennis Association and the International Cricket Council. And he told the Scottish Daily Mail that he has become "depressed" by the state of the game in Scotland and fears an "accelerating level of decline that will lead to international oblivion." In his blueprint for change, Gray recommended the sale and lease-back of Murrayfield in an attempt to lift the burden of debt. But Dodson responded: "We have got the debt down to a much more manageable level. "The idea of doing a sale and lease-back at the moment is ill-advised when we're so close to reducing the debt to a manageable level that allows us to reinvest that money into the grassroots game. "We've doubled our commercial income in the last two-three years, we've sold out Murrayfield consistently and we've got growing attendances in our professional game, so I'm not convinced about where this embarrassing financial performance has come from. "If you look at where we stand, the performance of the union off the park has been the best for a generation." 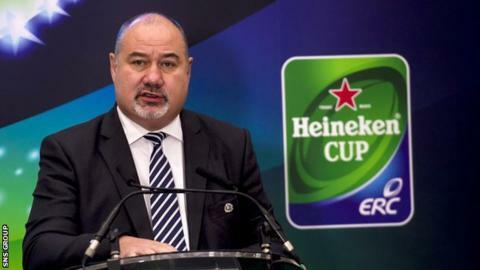 Dodson re-stated the union's much-ridiculed target of winning next year's World Cup, despite having won only 30% of games since he took over in September 2011 and only 20% of games in Scotland's bread and butter competition, the Six Nations. "We'll soon have a new coach in Vern Cotter, one of the most sought-after coaches in Europe," he said. "We've a summer tour, autumn internationals, a Six Nations and pre-World Cup games that are meaningful. We have four of those games instead of the normal two. "We're going to France, Ireland and Italy as well as playing Italy at home and we have the Six Nations before that. We believe we're going to develop a team that is going to be competitive. "We have a whole raft of reasons why you should be positive about what we're trying to do. "If you look at the centre partnership of Matt Scott and Alex Dunbar, if you look at a back three of Stuart Hogg, Sean Maitland and Tim Visser, if you look at a pack that can compete with any other pack in the world on its day. "There are reasons we should be cheerful about."